It seems to me that when congregations are at a point in their church life where growth has become stagnant; their presence in their community has become irrelevant; or the life and energy of the church is whimpering along, a sense of desperation creeps in which can cause panic and a need to DO something, CHANGE something. But the question that I believe needs to be asked first is “Are we prepared to DO something, CHANGE something?” When unprepared, change can be a death sentence to a congregation because most likely it is the kind of change that we least expected or wanted or it is the kind of change that brings us out of our comfort zone and causes us to cling to the unhealthy, yet familiar habits (even if the habits are what is slowly killing the congregation.) Less time is taken to prepare the congregation, to prepare the space for change to happen. In Genesis 1, God spent the first three days preparing the space. First, God created day and night, then sky and clouds, and lastly land, plants, and sea. God spent the next three days, creating life that could live in those spaces – the sun, moon, and stars for the day and night; the fish and birds for the sea and sky; and finally people and animals for the land and foliage. God took the time and made sure that there was space to sustain, nourish, and nurture the living things and creatures that God created. It makes sense. How much better off would congregations be if more time and care was taken to prepare ourselves for the necessary changes so that our congregations could be vibrant and healthy? In St. John’s heyday, we averaged over 300 people in worship. When I started at St. John’s back in 2003, our membership peaked at 120. Partly due to the transient nature of San Francisco, our membership was like a revolving door. Every year, we would gain about 20 members and lose about 20 members – never really growing, but also never really diminishing. Originally, my job description was centered around reaching out to an increasing population of Chinese-American families in our neighborhood, hoping that it would increase our membership as well as our pledges. Many ideas came floating my way about how we could reach out to them, ranging from passing out flyers door-to-door to redecorating the church foyer with a more Asian flavor. But not much thought was given to how prepared a mostly white congregation was to welcoming a more diverse group of people and how it would change the make-up and essence of the church. Also, changing simply because change is necessary doesn’t come across as authentic and genuine as we may think. I have spent the last seven years with the cooperation of my head of staff and the elders and deacons, restructuring our leadership as well as our focus – shifting our mentality from “in-reach” to outreach. Our mantra is “everything we do is outreach” – from mission projects to simply allowing coffee and food in the sanctuary to providing inviting spaces for families with small children to worship to our many fellowship gatherings. Everything we do is outreach. This seemed to give us a freedom to let go of the habit of doing things the same way just because and constantly evaluating what we do in order to remain relevant in our congregation and community. By preparing ourselves mentally and spiritually, we were better prepared to adapt to any necessary changes. Our weekly food pantry was less about bringing people into the church and more about reaching out to those who are hungry in our community. Our worship was less about just fulfilling the needs of long attending members and more about how we make worship inviting, comfortable and accessible to those in all stages of their faith journey. Welcoming young families was less about what they can do for us and more about how we as a faith community can care, support, and honor each other in all walks of life. These may seem like small changes, but these small changes better prepared us for some bigger changes. Especially when the bigger changes came from unexpected circumstances. Over the summer, we lost two renters. A Korean congregation and a Nazarene congregation closed their doors. Not only were we sad about the fate of these two churches, but also concerned about the needed income that they provided. However, because our congregation has been in the habit of adapting to change, this became an opportunity to reexamine how we use our worship space and dream the possibilities of how our space can be better utilized in our community. 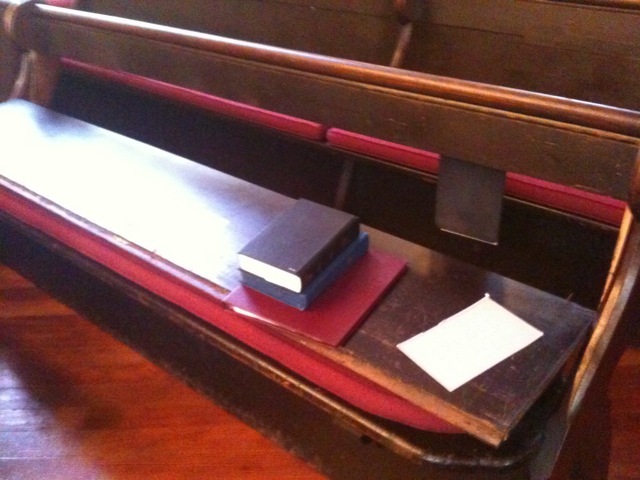 As if we didn’t need another sign from the heavens, a pew broke. These pews are as old as the church building – over a 100 years old. When our worship team met, I had them gather around the broken pew and posed a question to them, “Do we fix it or examine how we can better use this space to enhance worship as well as other uses for the community?” And without hesitation, they embraced an opportunity for change. I do love the story of Creation. I find it fascinating that God took the time to create space so that creation could happen. God moved space that was formless and empty and crafted it into something that would produce something life-giving, nurturing, and productive. Change can be life-giving, nurturing, and productive if planted in a space that is prepared to sustain it. You’ve probably heard of it, but just a shout out to the fantastic idea of Broad Street Ministry in Philly that took out the pews in their old sanctuary and asked everybody just to bring individual chairs from home, or a junk heap, or wherever. Most are wooden, but having no two the same is AWESOME as it speaks to diversity and unity in Christ. And it’s….free! Oh, and the aesthetics are actually really nice, if you ask me. That is actually an awesome idea Adam. I’ll have to look into that. What a creative way to bring something personal and meaningful into a worship space. Cool. Email me if you want pictures. I can probably find some somewhere.